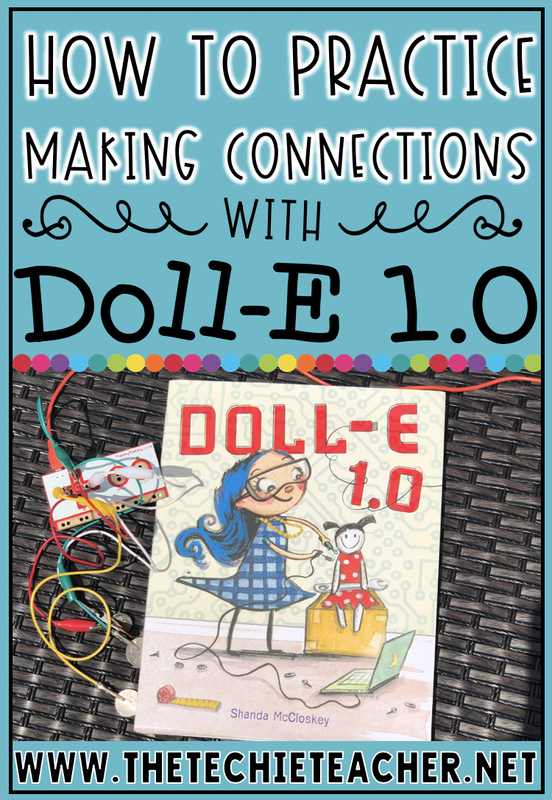 How to Practice Making Connections with Doll-E 1.0 | The Techie Teacher® . This past month I ran across a new book that I had to immediately add to my Technology Themed Children's Books List: Doll-E 1.0 by Shanda McCloskey is a story about a little girl named Charlotte who likes to "tinker, code, click and download". One day Charolette's parents gave her a doll with the hopes that she would become a little less connected but Charolette doesn't know what to do with her new doll. When she discovers that her doll had a battery supply that made her talk, Charolette became much more intrigued with her new gift. One day Blutooth, Charolette's dog, snatched her doll and ripped it to shreds. Instead of picking up the pieces and throwing them away, Charlotte set out to fix and even improve her doll with a few spare parts and a bit of code. This is a great story of creativity and determination! You can click on my Amazon affiliate link below to find this in hardcover as well as a Kindle edition. All of our previous experiences, knowledge and emotions affect how we comprehend what we read. Therefore, we need to guide students in applying their background knowledge to make meaning of texts by making text to self, text to text and text to world connections. 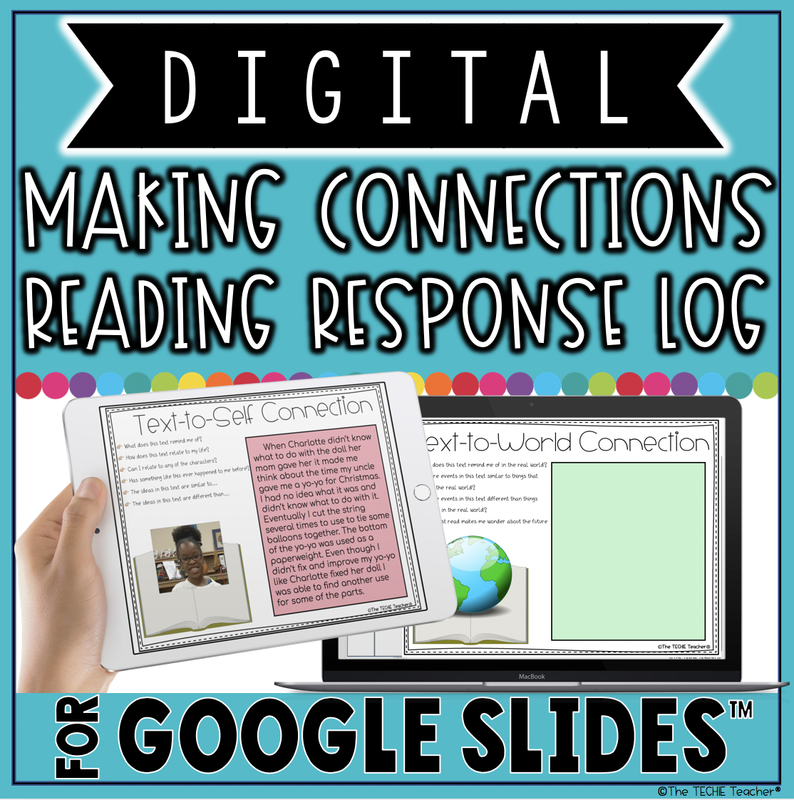 I created this Digital Making Connections Reading Response Log that can be used with any text to help students make connections to stories they read. I included questions on each slide to help guide their thinking and they can respond in the box by either typing a response or drawing a picture. Both a PowerPoint and Google Slides™ presentation come in this download. Slides are set to print on 8.5 x 11 paper if you would rather have a paper/pencil copy. Last Sunday I participated in The Reading Crew's Face"book" Hop and talked about how Doll-E 1.0 is a great story to use when teaching how to make connections. I offered the resource above for FREE and said it would be free for a week. Well, I really want to offer my readers this resource in case you missed the Hop so I will keep it FREE for the next week. Just click the image above. Enjoy! To see a list of MORE technology themed children's books, click HERE. Thank you, Julie, for loving and spreading the word about my book - Doll-E 1.0! This making connections post is so cool! I'm honored. You are doing FABULOUS work! Yay, Shanda!!! Thank you for stopping by :) I plan on sharing your book during our STEM in Literacy presentation at FETC in January!